Siilly Phillie Rocking Horse Baby Gifts are always among our best sellers. It's not difficult to imagine why. They are built upon a beautifully finished white wood rocking horse that makes a great keepsake toy as baby grows, they include quality layette items for baby, and they never fail to make a big gift impression. The newly introduced Rocking Horse Gift for Twins is another knockout that you might say is "twice as nice"! It includes�two of everything except for the rocking horse and plush bear. Made in the USA layette items are decorated with I Love Twins designs. The gift can be ordered in boy/girl, boy/boy, or girl/girl combinations.Everything is gorgeously presented as shown in the photo, then elegantly gift wrapped in tulle for that final special touch. 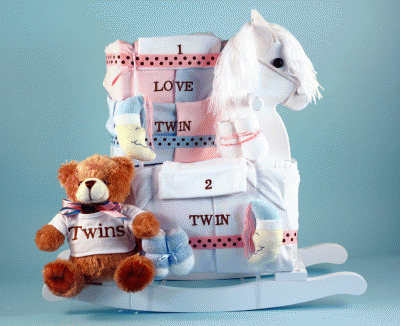 Siilly Phillie�Rocking Horse Baby Gifts are always among our best sellers. It's not difficult to imagine why. They are built upon a beautifully finished white wood rocking horse that makes a great keepsake toy as baby grows, they include quality layette items for baby, and they never fail to make a big gift impression.